PR is considered by some as frills. Not a necessary arm of a business. This has been quite evident in the past few years as companies have faced slimmer margins in Australia’s slow economy, with consumer trepidation effecting sectors from FMCGs to property. 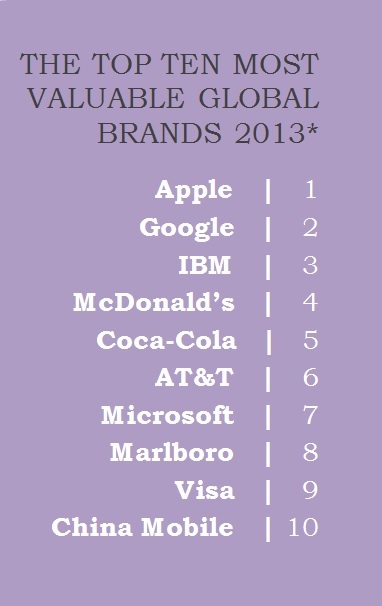 BrandZ, the world's largest brand equity database, released its Top 100 most valuable global brands 2013 in May, and valued the 100 brands at $2.6 trillion. With Google increasing 5% in bland value, while Apple only increasing 1%, reputation is vital to survival in this highly competitive marketplace. Public relations practitioners work to not only promote brands, but to protect them. PRers are the first line of defence on messaging, not only what a company is saying, but how it is saying it. What is quietly threaded through every company in the BrandZ Report is an effective public relations component. Not one of the top ten brands, or any listed in the report, would be included if the brands were not both promoted and continually protected. Even the most gifted PR practitioner cannot stop all issues arising, but they can often circumvent crises, minimising brand damage. This is a result of firstly skills in a crisis, but also ongoing stakeholder relationship building. If an unwise executive cuts PR from the budget, stakeholder relationships will suffer, and eventually so will the brand.